Indian fighter jets crossed the Line of Control before dawn on Tuesday and carried out surgical strikes within Pakistan to target a training camp of the terror group Jaish-e-Mohammed (JeM). In the first cross-border air strike in almost five decades, 12 Mirage 2000 jets struck the training camps of Jaish and Lashkar-e-Taiba inside Pakistan and completely eradicated over 300 terrorists with 1,000 kg bombs. The operation that begun at 3.30 am on Tuesday, was over in 19 minutes. The strikes came as a befitting reply to the February 14 Pulwama attack that claimed 40 Indian jawans. Key JeM terrorists targeted were JeM chief Maulana Masood Azhar's brother-in-law Maulana Yousuf Azhar alias Ustad Ghouri, who was involved in the IC-814 hijacking. The jets hit Balakot, Muzaffarabad and Chikoti at 3.45 am and was over at 3.53 am. 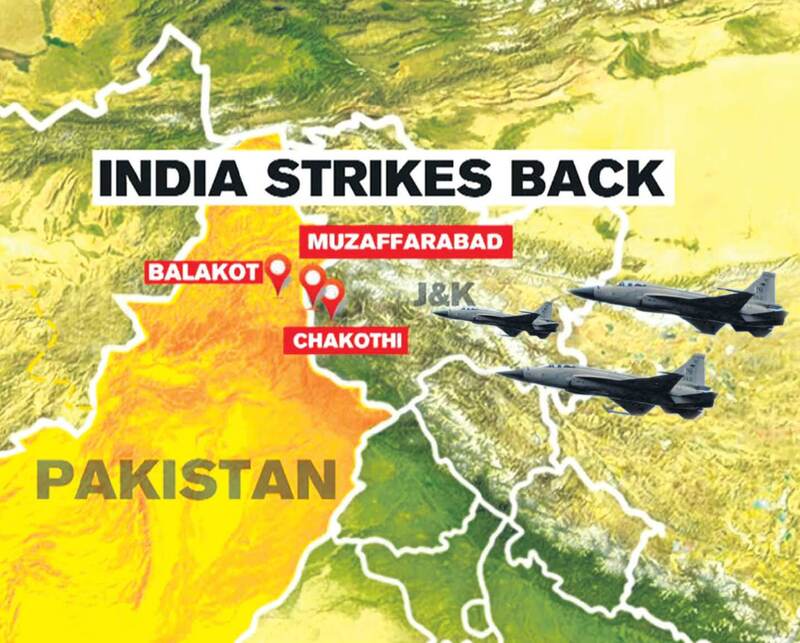 The Hitting Balakot comes as a historic high for IAF because it not only crossed the LoC (Line of Actual Control), they crossed the entire Pakistan-occupied Kashmir (PoK) and hit the target inside Khyber Pakhtukhwa. It was also the biggest Jaish camp. Reportedly, the IAF had deployed an elaborate support system for these surgical strikes. Surveillance was heightened, Heron drones and early-warning system AWACS were used to keep an eye on any action emanating from Pakistan while mid-air refuellers were also deployed for any possible emergency use. There are several unconfirmed reports that Pakistan might have tried to intercept IAF jets but failed since even Pakistan did not claim of shooting down any Indian jet. A report said that while Pak jets did scramble to retaliate, they turned back due to the sheer size of the Indian formation. Tuesday morning, the Pakistan government confirmed that Indian forces carried out 'non-military pre-emptive' strike on terrorist camps of the Jaish-e-Mohammed in Pakistan. “Once again [the] Indian government has resorted to a self-serving, reckless and fictitious claim,” a statement issued after the meeting said. “This action has been done for domestic consumption, being in an election environment, putting regional peace and stability at grave risk.” Pakistan Foreign Minister Shah Mahmood Qureshi said India has committed “aggression” by violating the LoC and Islamabad has “right to respond.” Qureshi said Pakistan will take international media to the area of strikes. Helicopters are being readied, right now weather is bad, will fly when weather permits, he said. A Pakistani unmanned aerial vehicle (UAV) was shot down on Tuesday near the International Border in Kutch district of Gujarat, police sources said. Debris of the UAV was seen near Nanghatad village in Abdasa taluka of Kutch, they said. On hearing a loud sound around 6 am, villagers went to the spot and found the debris of the UAV, the sources said. A police official said “Such an incident has happened, we are investigating the matter.” He, however, refused to elaborate further. The Cabinet Committee on Security met at the residence of the Prime Minister Narendra Modi after the Indian Air Force carried out air strikes in Pakistan. Finance Minister Arun Jaitley, External Affairs Minister Sushma Swaraj, Home Minister Rajnath Singh and Defence Minister Nirmala Sitharaman were present at the meeting. Sources said National Security Advisor Ajit Doval, other top officials of the Prime Minister's office and security officials were also present at the meeting. Lok Sabha Speaker Sumitra Mahajan praised the Air Force for the strike. She also congratulated Prime Minister Modi, saying the action sent a strong message to Pakistan that it should not look at India with evil eyes. Mahajan said the operation was so swift that Pakistan appeared clueless about what happened. “Our air warriors returned unscathed after taking action against the terrorists' hideouts but the neighbouring country is still clueless about what happened,” she said. “Aaj Churu ki dharti se mai desh vasiyon ko vishwas dilate hu ki desh surakshit hathon me hai (Today, from this land of Churu, I want to assure the people of this country that the country is in safe hands). Jaag raha hai desh mera, har bharatwasi jitega, saugandh mukhe is mitti ki, mai desh nahi mitne dunga (The country is awakening, every person from Bharat will win, I swear by this soil, I won’t let this country being erased),” Modi said. Australia also urged both India and Pakistan to exercise restraint as tension runs high with the latest counter-terrorism measure opted by the Indian security forces in the aftermath of the Pulwama terror attack. Foreign diplomats from USA, UK, Russia, Australia, Indonesia, Turkey and six Asean nations have been briefed by Foreign Secretary Vijay Gokhale on the airstrike. China, too, asked India to “exercise restraint” at this crucial hour. According to a news report, Chinese Foreign Ministry spokesman Lu Kang told the media in Beijing that the country has “taken note of relevant reports.” “I want to say that India and Pakistan are both important countries in South Asia. A sound relationship and cooperation between the two serves the interests of both the countries and peace and stability in South Asia,” he said. “We hope that both India and Pakistan can exercise restraint and do more to improve their bilateral relations,” Lu Kang said.